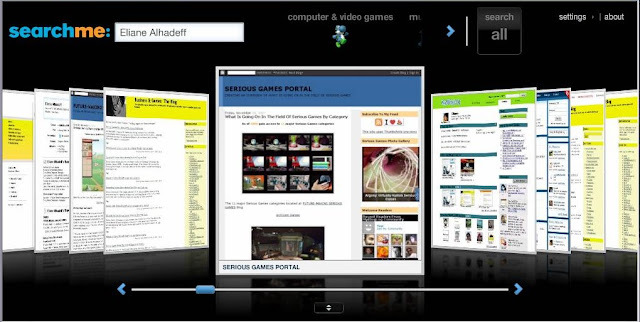 Searchme, founded by Randy Adams and John Holland, is a visual search engine that launched into private beta in March 2008. Searchme is a new search engine that uses visual search and category refinement. It is expected to help you find what you’re looking for, faster, with a lot less spam (and a lot more fun, I would add). It’s a new way to search that takes advantage of the size and bandwidth of today’s Internet and the increasingly visual way that we all interact online. The idea for Searchme came when Mark Kvamme, Searchme’s chairman, got tired of looking through a bunch of unrelated results for articles on motocross. He suggested to founders Randy Adams and John Holland that they create a search engine that sorted results into categories. The Searchme visual interface came about when Randy, a father of seven, helped his four- year-old son search for children’s web sites that he’d seen on TV. It struck Adams that if a search engine could show big pictures of the pages it found before users clicked through to a site, it’d be much easier to quickly find what they were looking for. After more than three years of engineering, imaging billions of web pages, and fine-tuning our approach many times over, Searchme was born. They've built it from the ground up to optimize it for speed, but they still have a long way to go. They’re just getting started on their first steps toward creating a smart new way to search today’s Web. 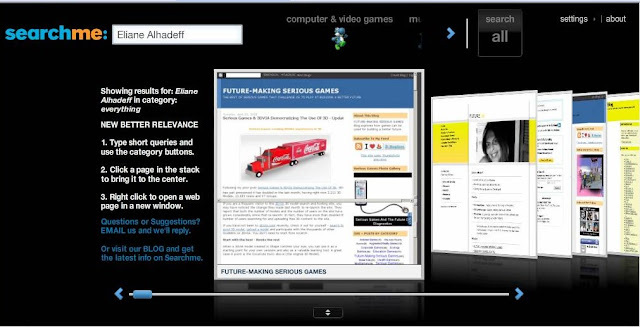 The Future of Web Search: What Could The Future Look Like? By Dr. Eric Glover, Searchme’s Classification Architect. Eric is responsible for the design and implementation of Searchme’s categories feature, a seemingly simple tool that springs from an exciting area of artificial intelligence (AI) research and development. Imagine the Internet five years from now: As you begin to type a word into a search engine, it seems to know you personally. It naturally gravitates towards your unique interests and preferences. Rarely do you need to type more than one or two words before it shows you exactly what you’re looking for. On the occasional instance when it doesn’t correctly guess your intention, it’s easy to correct and quickly get to what you want. For example, a student doing research for a school science project sees only science web sites that are appropriate for someone his age. A few hours later, he searches for information on his favorite video game, and he’s able to easily re-focus the engine on reviews and downloadable expansion packs. At Searchme, they are working to move toward this future and prove that it is possible by demonstrating some of the initial steps to get there.